OS grid reference SX 0506 8845. On Vicarage Hill Lane at Glebe Cliffe close to the seashore and just to the west of the famous Arthurian village of Tintagel, north Cornwall, stands St Materiana’s church, also called Mertheriana’s, an ancient religious foundation that is now the parish church. At the west end of the south transept there is a Roman milestone commemorating the Emperor Licinius which dates from the 4th century AD. 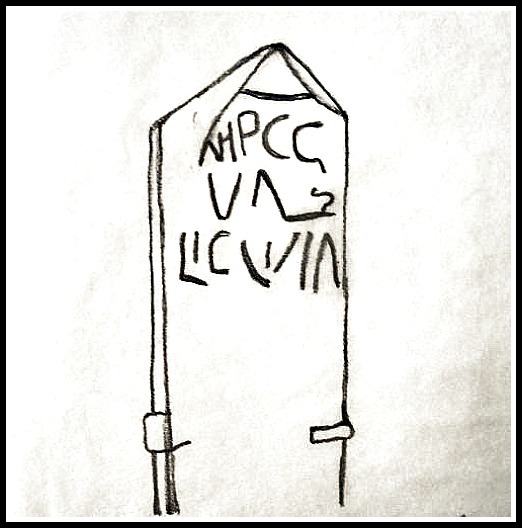 The inscription on the stone reads IMPCG VAL LICIN (the Emperor). This would be Caesar Galerius Valerius Licinianus (308-24 AD). This milepost was originally built into the church lychgate (Lower Church Stile) where it had been used as a coffin rest! but in 1888 it was brought inside the church for safety. 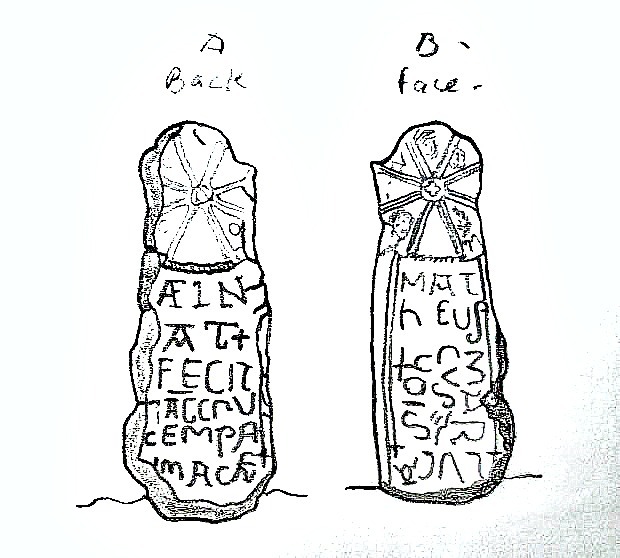 Another Roman milestone was found at nearby Trethevy village. This has a Latin inscription: IMP C DOMIN GALLO ET VOLUSIANO honouring Gallus* and Volusianus (AD 251-253). *The Roman emperor Gallus ruled together with his son Volusianus. Also housed inside the church at the west end of the nave is a very fine Norman font bowl which is said to have come from St Julitta’s Chapel in the grounds of Tintagel Castle. The church dates from about 1080 AD and was built on the site of a Saxon or Dark-Age settlement. Much of it’s wonderful carved stonework is from the Norman and medieval periods, especially the north doorway (1080) and the south doorway (1130). The building was restored in the 1870s by J.P.St Aubyn. St Materiana (Madryn or Madrun) was a 5th century princess from the south-east of Wales who came to live in the area as a nun with some female companions. She founded the first church and, possibly a monastery, at Minster (Talkarn) near Boscastle (SX 1105 9046) some 5 miles to the east of Tintagel. She was eventually buried at Minster with her feast-day on 9th April. Her tomb existed in the ‘mother church’ of Boscastle (which is also dedicated to her) in Minster Woods about half a mile east of that village, in the Valency Valley, up until the Reformation. According to the ‘Legend’, Materiana was the daughter of Vortimer the son of the British King Vortigern (of Wales), and later she married Ynyr, King of Gwent. However, she decided to lead a religious life and with her companions Marcelliana and Uliet (Juliot or Julitta) sailed to north Cornwall where they set about their mission to covert the local people to Christianity. St Uliet (Juliot) founded a small monastery on the eastern promontory of Tintagel Head, opposite Tintagel Castle, circa 500 AD, which was excavated by archaeologists in the 1930s. There is a church dedication to St Uliet at Llanilid in Mid Glamorgan, south Wales, where she is described as being one of the many daughters of King Brychan of Brecknock (Brecon) whose second wife was called Marcella – maybe St Marcelliana? St Materiana’s holy well can still be seen in Minster churchyard. Back in the village of Tintagel itself and in the grounds of the former Wharncliffe Arms Hotel (now new flats) on Fore Street stands a 5th-6th century Celtic cross. Although the cross dates from that time the carvings and an inscription are thought to have been carved in the 10th or 11th century? Originally the cross, which is just over 4 feet high, stood at nearby Trevillet where it had been used as a farm gatepost and has therefore suffered some damage. It has wheel-head crosses on both faces and also Latin inscriptions. On the front face there is the inscription: AELNET FECIT HAN CRUCEM PRO ANIMA SUA or ‘Aelnet made this cross for the sake of his soul’. On the opposite face the names of the four Evangelists MATHEUS, MARCUS, LUCAS AND JOHANES with their beaded faces being carved into the angles of the expanded cross-arms. Pevsner, N & Radcliffe, E., The Buildings Of England, Cornwall, Penguin Books, 2nd edition, 1970. Spencer, Ray., A Guide to the Saints of Wales and the West Country, Llanerch Publishing, Felinfach, Lampeter, Dyfed, Wales, 1991. Ashe, Geoffrey., The Quest for Arthur’s Britain, Paladin Books, St Albans, Herts, 1971. Categories: Ancient Churches / Chapels, Inscribed Stones, St Materiana's Church at Tintagel in Cornwall | Tags: Ancient Crosses, St Materiana's Church at Tintagel in Cornwall | Permalink.